Der Artikel Black Composers Series 1974-1978 wurde in den Warenkorb gelegt. +Anderson: Essay für Orchester "Squares"
Leontyne Price war der erste schwarze Superstar der Klassik. Aber es gab und gibt natürlich nicht nur Interpreten mit dunkler Hautfarbe, sondern auch Komponisten. 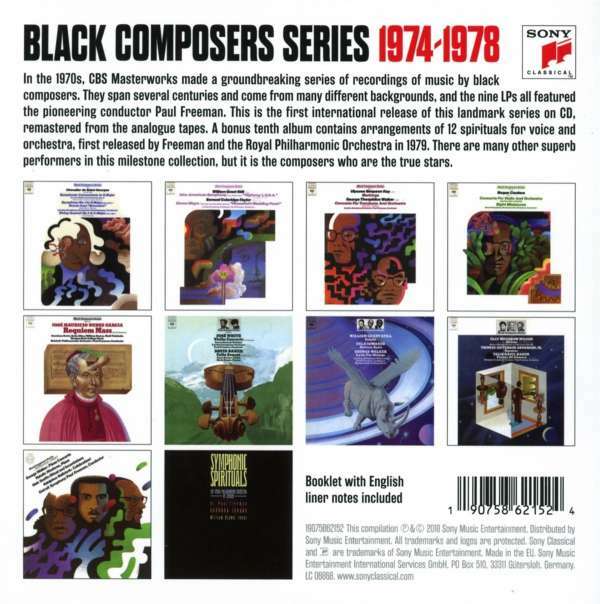 Von 1974 bis 1978 erschien bei Columbia Masterworks die Black-Composers-Schallplattenreihe, die jetzt erstmals gesammelt auf CD veröffentlicht wird. Es beginnt mit Joseph Bologne, Chevalier de Saint-Georges, der Ende des 18. Jahrhunderts einer der angesehensten Komponisten in Europa war. William Grant Still (1895–1978) hingegen schrieb die erste »Afro-American Symphony«. Es gab so individuelle Stimmen wie die von José White Lafitte (1836–1918) mit seinem eindringlichen Violinkonzert oder David Baker (1931–2016), hier mit seiner Cellosonate vertreten, gespielt von keinem Geringeren als Janos Starker. Auf 10 CDs finden sich hochindividuelle Kompositionen und Aufnahmen, die es verdienen (wieder-) entdeckt zu werden. Fast allen gemeinsam ist die musikalische Leitung durch den so engagiert, wie imaginativen Dirigenten Paul Freeman. 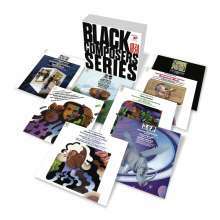 In the 1970s, CBS Masterworks made a groundbreaking series of recordings featuring the music of black composers. The nine LPs released all featured the pioneering conductor Paul Freeman. Sony Classical is proud to reissue the complete Black Composer Series in a single original album collection with each CD remastered from the original analogue tapes using 24 bit / 192 kHz technology. The composers featured span several centuries and come from many different backgrounds. The earliest is the unique Chevalier de Saint-Georges (1745–1799), a composer, violinist and swordsman born in Guadeloupe who spent most of his life in France. A whole album of his music includes the Symphony op. 11 / 1, the String Quartet op. 1 / 1 and the Symphonie Concertante op. 13. Another complete album is dedicated to the Brazilian composer José Maurício Nunes Garcia (1767–1830) and his extraordinary Requiem Mass for Queen Maria I. José Silvestre White (1835–1918), a Cuban virtuoso violinist-composer in the mould of Wieniawski, taught pupils including George Enescu, and his Violin Concerto is interpreted here by Aaron Rosand. The English composer Samuel Coleridge-Taylor (1875–1912) enjoyed considerable success in his lifetime, most of all through his cantata Hiawatha’s Wedding Feast, an aria from which is included here, as is his orchestral Danse nègre. Coleridge-Taylor visited the USA several times, and was an inspiration for the young William Grant Still (1895–1978). Still’s Afro-American Symphony, the first by a black composer to be performed by a major orchestra, draws strongly on the musical language of the blues. His ballet score Sahdji and two arias from his opera Highway 1, U. S.A. are also included. Among the many other 20th-century composers featured are the Nigerian Fela Sowande (1905–1987), the Panamanian Roque Cordero (1917–2008), and the American Ulysses Simpson Kay (1917–1995). George Walker (b. 1922) has been called “one of the greatest composers of our time” by Fanfare, and three works by this Pulitzer winner are included: the Trombone and Piano Concertos as well as his Lyric for Strings. David Baker (1931–2016), the renowned jazz cellist and composer, was a pupil of Janos Starker, who plays his Cello Sonata. Hale Smith (1925–2009), another composer deeply involved with the world of jazz, is represented by his Ritual and Incantations. Other composers featured in this collection include Olly W. Wilson, T. J. Anderson, Talib-Rasul Hakim and Adolphus Hailstork. A bonus tenth album features Smith’s Symphonic Spirituals, arrangements of 12 spirituals for voice and orchestra, first released by Paul Freeman and the Royal Philharmonic Orchestra in 1979. Besides those already mentioned, the many superb performers in this collection include the London Symphony Orchestra on several albums, the Baltimore and Detroit Symphony Orchestras, and the Juilliard String Quartet. But it is the composers, many still little known today, who are the true stars of this milestone collection. Hörprobe Track 5: What Does He Know of Dreams ? What Does He Know of Dreams ?